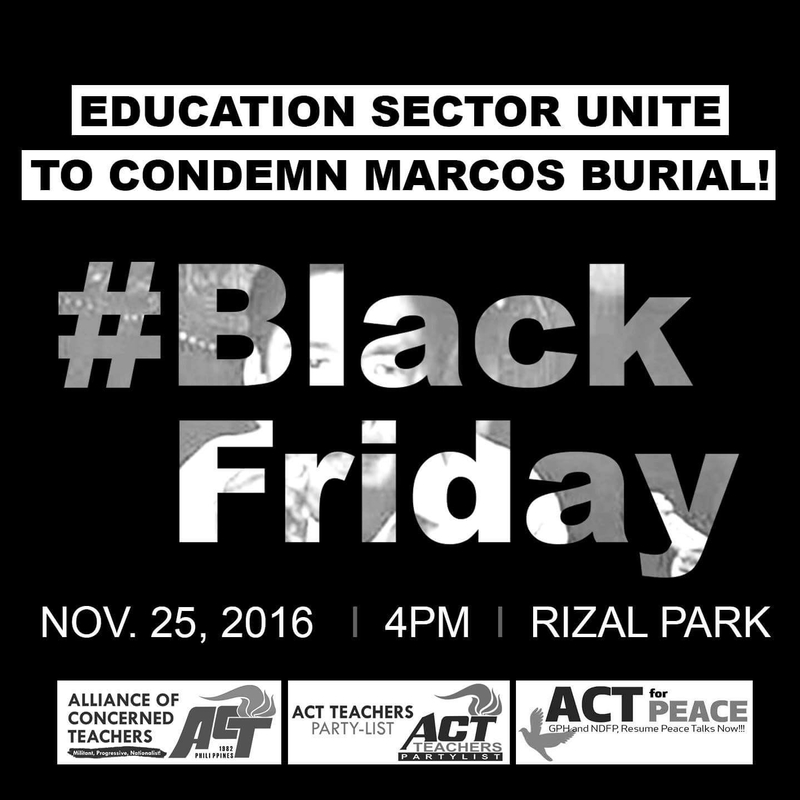 #MarcosNoHero Education Sector to join the November 25th Black Friday Protest, 4pm at Luneta! The education sector is one with the Filipino people and victims of Martial law in denouncing the Supreme Court Decision allowing a hero’s burial for the fascist, plunderer and tyrant Ferdinand Marcos. We have not forgotten and will continue to resist attempts to rehabilitate the Marcoses. “This direct act of contempt against the historic judgement of the Filipino against the Marcos dictatorship must be stopped at all costs,” Mr. Benjamin Valbuena, President of the Alliance of Concerned Teachers (ACT) said. President Duterte’s open support for the Marcoses and rants against us seeking justice reeks with contempt for the people who suffered under martial law dictatorship. He is fulfilling his promise to the Marcos in exchange for financial and political support last election. We resent President Duterte’s decision to do so and this created a blackened spot on his term. “Let the Marcoses bear the wrath of the Filipino people and victims of Martial Law for refusing to even acknowledge Marcos’ tyrannical rule. That fateful day last November 18th, the people have spoken for justice and not even a President in power can stop the flames of rage, “Mr. Benjie Valbuena stressed. Justice have eluded the Filipino people for the crimes of the Marcoses and their cronies under the Marcos fascist regime. But the academic sector also denounces the inaction of every regime since 1986 for accommodating the Marcoses and their cronies. Because the Aquino’s and in-between regimes are equally contemptible for the continuation of graft and corruption, servility to US and IMF-WB impositions that made our country to a perpetual state of backwardness. 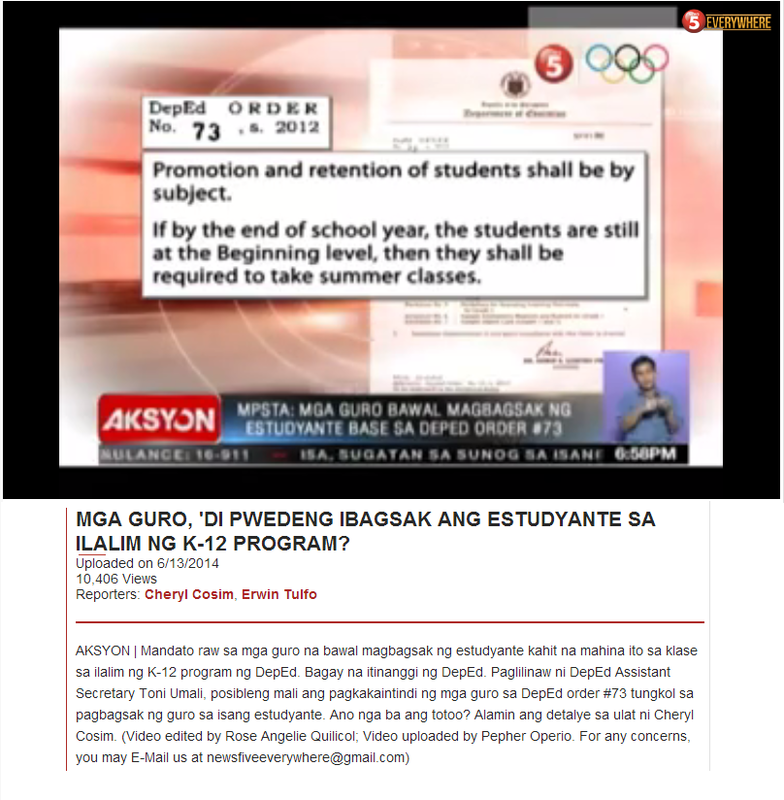 “We call on the education sector to join the protest rallies on November 25, 4pm at Luneta. For those outside of Metro Manila, organize protest action centers and/or coordinate with BAYAN chapters who are also organizing protest actions, Mr. Benjie Valbuena ended. But the academic sector also denounces the inaction of every regime since 1986 for accommodating the Marcoses and their cronies. Because the Aquino’s and in-between regimes are equally contemptible for the continuation of graft and corruption, servility to US and IMF-WB impositions that made our country to a perpetual state of backwardness. It is unfortunate that one cannot distill the above into a short hashtag such as #MarcosNoHero. And it is very likely that most would miss the point of the above wordy but quite important message. 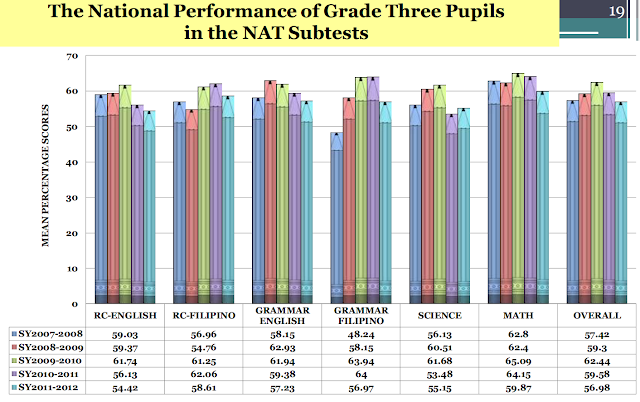 The Marcos regime is clearly not orchestrated by one person, Ferdinand Marcos. Herein lies what is often missing in protest actions against Marcos and history. The country has always been under an oligarchy with an extreme degree of patronage politics. The country has long been on the receiving end of global forces such as the Cold War, rise of neoliberalism, and foreign aid. Thus, to reduce what happened over thirty years ago to a burial is extremely reductionist. We often prefer to see things in black and white. The danger here is we always miss the gray.